A faulty sensor aboard a prototype rocket likely led to its destruction last week during a flight at SpaceX's test facility in Central Texas, company officials said. The rocket testbed, powered by a modified first stage from the Falcon 9 booster with three engines, flew off of its prescribed trajectory during an Aug. 22 vertical takeoff and landing test flight. The rocket's on-board safety system recognized the problem and issued a self-destruct command. A video of the incident showed a fireball envelop the rocket, then debris raining down on SpaceX's test site in McGregor, Texas. The Falcon 9R Dev 1 was designed to demonstrate reusable rocket technologies for SpaceX's operational launchers. SpaceX aims to return a Falcon 9 first stage to a precise vertical touchdown on land or an ocean platform by the end of the year. SpaceX founder and CEO Elon Musk said in a statement Tuesday that the cause of the prototype rocket's demise was a "blocked sensor port." Garrett Reisman, who heads SpaceX's effort to develop a private space taxi for NASA astronauts, said Wednesday that the investigation into the loss of the rocket testbed is not yet complete. "I can tell you that it certainly looks like it was basically a single-point failure that existed on that test article that does not exist on the Falcon 9," Reisman said. "We think it was a failure of a single sensor, and Falcon 9 has multiple sensors in its algorithm that it uses. So if the same failure occurred on the Falcon 9 it would not affect the mission in any way." The sensor failure in one of the three Merlin 1D engines on the Falcon 9R caused the vehicle to stray from its intended flight path, triggering an automatic self-destruct command to ensure it did not threaten nearby people and property. Reisman said an operational Falcon 9 flight, which uses nine first stage engines, could overcome the loss of an engine. On the three-engine Falcon 9R, such redundancy does not exist. "We've been taking a lot of risks with the [Falcon 9R], so we're flying this thing in flight regimes and ConOps (concept of operations) that it was not designed for, all in an effort to learn," Reisman said. "One of the risks bit us last week, and one of the single-point failures failed, which we knew was a possibility." The Falcon 9R Dev 1 vehicle was the second in a series of vertical takeoff and landing rocket testbeds built by SpaceX. It followed the Grasshopper, a smaller single-engine rocket. 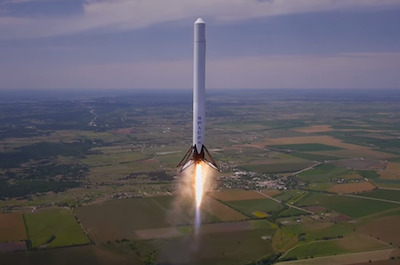 Fitted with landing legs around the base of the rocket, the Falcon 9R Dev 1 was designed to take off from a concrete pad, fly to a predetermined altitude, then descend under rocket power to a precise touchdown. The sensor failure led the rocket astray on the Aug. 22 flight. "We set a certain bound, and if we exceed that bound either vertically or laterally, then the flight computer initiates the sequence that occurred," Reisman said. SpaceX plans to transfer future flights like the mission lost Aug. 22 to New Mexico, which offers a more remote environment for higher-altitude tests. Engineers found no link between the Falcon 9R mishap and operational flights of the Falcon 9, but SpaceX postponed this week's planned launch of the commercial AsiaSat 6 telecommunications satellite as a precaution. "Had the same blocked sensor port problem occurred with an operational Falcon 9, it would have been outvoted by several other sensors," Musk said in a statement. "That voting system was not present on the test vehicle."